And many such benefits. You can even use the Nano Health Bio Energy Card to keep food fresh in your refrigerator. This Card is essential to ensure your peace of mind and relief from health problems. With the Bioenergy card in your pocket you can concentrate on living your life. Remember, prevention is always better than cure. Stop your health from unnecessary decay, and enjoy optimum energy. 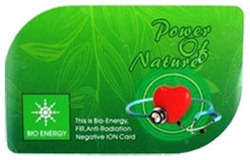 The Nano Health Bio Energy Card is a natural holistic way of preserving your health. Gain Mantra is diversified business corporation with balance portfolio in various sectors. Gain Mantra is led by team of expierenced proffesionals. Gain Mantra is one of India's upcoming houses iwth multiple business activities across the country.Direct selling retail format & E-commerce forms the creative business activity of Gain Mantra.